Sophie Shevardnadze: Katrina, it’s great to have you with us again, we’ve missed you, it’s been a while. 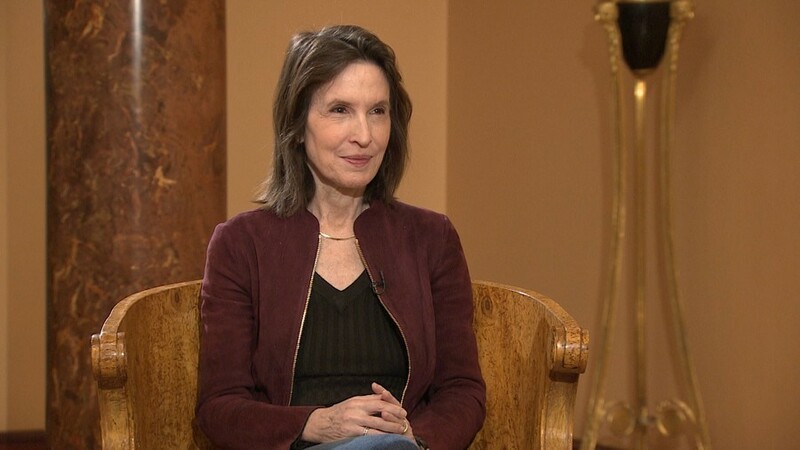 Katrina vanden Heuvel: Thank you very much. SS: You said the relations between Russia and the United States are at their lowest point. In one of your articles, I think, you said, that the Democratic party, instead of containing the fire is actually fanning the flames. Do you think if Trump was super-hawkish towards Russia, then the Democrats would actually want peace with it? KH: So here’s the paradox… First of all, opposition to Trump, – and the Nation magazine, which I edit, opposed Trump on many issues, particularly domestic issues, – but opposition to Trump should not be opposition to common sense. It is common sense that the United States and Russia have a working relationship on key areas, such as nuclear proliferation, on setting up rules of the road around cyber, on trying to de-escalate the war, conflict in Syria. So there is a set of issues where it would be valuable for the US and Russia to partner on. The Democratic party, with very few exceptions, has chosen a different path – to argue that Trump is not capable of engaging Russia. There’s a criminalization of diplomacy, which I think is very dangerous, Sophie, not just for Trump and Putin, but for US-Russian relations generally. The irony is that Trump is hawkish, he’s brought in John Bolton, as your viewers may know, leading neoconservative who is the architect of America’s withdrawal from the Anti-Ballistic Missile Treaty in 2002, the sanctions continue. So the relationship is at its lowest and most dangerous point, and I just think Trump doesn’t have a team that is capable of moving in a different direction, nor is he disciplined enough to do so. SS: We are actually going to talk a little more about Bolton and his neoconservative advisors that are surrounding Trump, but before we get to that, what do you think has to happen for the Democrats to actually change their approach towards Russia? KH: So… I think there’s a new generation of Democrats. We just had an election, as you know, a mid-term election, it’s not the presidential, it’s the off-year. A new generation of leaders have come in, many of them women, I am excited about that, but I am most excited about their politics, and some of these women… There’s a woman named Alexandria Ocasio-Cortez, who asked… She proposes Medicare for all, and people say, you can’t afford that, and she says, we can’t afford endless war. She has a peace plank, which is about cutting our defence budget, so the need to connect the dots between that and not having a new Cold War, if you have a new Cold War, I like to say, I think it’s true through history, I think it’s very bad for Democrats and progressives, it empowers the war parties in both countries, it empowers the nationalists, it takes resources from our budget that should go into re-building our country, not perpetual war. So I think there’s an opportunity, and there are few Democrats who understand this, but there will be many investigations in the new Congress, the House of Representatives has the subpoena powers, they will investigate Trump’s taxes, his corruption, and I think there’s a role for that. But I hope that we can move from posturing and escalation to dialogue and de-escalation, because if Democrats really want to achieve their goals, to have this crazy relationship, with the increasing defence budget, and a new defence strategy, Sophie, this is important, which is about ending the global war on terror, which is a good thing, having spent $5.6 trillion… And now the focus is on conflict with Russia and China. I think this is madness! SS: I’m just thinking, the United States, unlike Europe, isn’t feeling the economic consequences of a stand-off with Russia, because Europe is hurting because of the sanctions, America isn’t, at least, that much. So for American establishment, for American politicians, for America media, it is just… It sells so well to have this anti-Russian stance, so I was just wondering, maybe, you know, it’s just going to go on forever, because there’s so little consequences to pay economically? SS: But what is the reason for it? If it’s not what the public wants to hear, what is the reason for it? It’s not just Russia, it’s really just an unconventional, confrontational foreign policy on all fronts, whether it’s China, or the European Union, or the Iran deal, or even NATO. What’s the reason behind it, then? SS: Yeah, that, bringing Putin, bringing 145 million breathing population of Russia to just one Putin, who is, like, eating babies for breakfast, if you ask the American media. KH: Trump is a very divisive figure. He has a base, but he manipulates fear, Sophie, in our country, and so, the opposition to Trump has become also opposition to Putin, Putin becomes Trump, Trump becomes Putin, we need to disaggregate that. SS: Well, that was super-intertwined, and I want to talk about that in detail, but before we get to that, I want to talk about the INF treaty, because that’s, like, the other big story around here. So Trump wants to pull out of it, his biggest argument actually being that the Chinese missile arsenal is outside its scope. Wouldn’t it just be easier to bring China in and actually enlarge the INF? KH: Well, there’s also the argument that Russia’s been violating the terms of the INF treaty, which is… I mean, you don’t withdraw from an arms control treaty, you try to expand it. You try to improve it. But you know, I come back to John Bolton, the neo-conservative advisor who Trump brought in, he was the architect of withdrawal from, I would argue, the most important stabilizing arms control agreement in 2002, the ABM, the Anti-Ballistic Missile treaty. The withdrawal from the INF is part of a larger problem, Sophie, it’s part of the unravelling of a stabilizing framework for arms control. If this goes down, and it was a great achievement, as you know, of Gorbachev and Reagan, abolishing an entire class of nuclear weapons in 1987, we could see the unravelling of arms control as we know it. And that is war for all. I mean, that is very-very dangerous. So I think there may be some common sense, but of course you’re right, instead of saying: “We’re going to get rid of it, because China is not part of it and it’s doing this and that!”, there should be an extension to China of this treaty. Let’s bring China in. It is one of the great superpowers rising. KH: Yeah, it may not, there may not be a withdrawal. I mean, it’s still in process. There’s still a fight on. SS: But I just wonder, technically, it’s like the supreme law of the land, right? Like, it’s stated in the Constitution. SS: So how come the executive branch, every time it feels like it, can just, like… Drop the rule? SS: Do you think you were heard? Do you think people like you, who are outspoken public figures about the reason, not about being friends with Russia, but about, you know, reasonable relations with Russia, that has to stay safe? KH: …or Putin’s puppets. Yeah, and I know, people like… Two people, one a Democrat, one a Republican. I recommend to your viewers Representative Ro Khanna, who represents Silicon Valley and California, he tries to speak for diplomacy – he is called names. Or Senator Rand Paul, who was here a few months ago, a Republican from Kentucky. He too believes there should be a working relationship, so... This is not radical. It is now, but it should be common sense, sober realism. SS: Katrina, getting back to Trump’s advisors, because we brought up John Bolton, and once again, the INF treaty, a lot of experts, whether it’s experts or professionals from the past or from the present day, just like you think that leaving the INF treaty for America would be detrimental, for its security. But Trump doesn’t really care about what anyone says but his advisors, like John Bolton, Navarro, Pompeo, they’re very, you know, neoconservative, very hawkish, so to say, politicians who are anti-Iran deal, anti-China, anti-Russia, sanctions… With these people in the picture, are we in for even more confrontation? SS: Extra risk that they are creating is willingly pushing the US on the collision course with other powers! SS: But America is pushing Russia into Chinese arms! KH: Well, you know, there is a view in the United States that Russia has no allies. I think the US… The Russia-China alliance will grow even stronger as a result. So yes, you have… I am no fan of Trump, by any measure, the Nation is one of his leading critics, but he is a hostage, in some ways, of these larger forces around him, whether it’s Mattis, or Pompeo, or Bolton. But it’s also… He’s a figure, and an accidental figure in some way, who knew that he would be elected President? He came into the White House, he had no team. He has no discipline. He has his Twitter feed, which allows him to speak to some 50 million Americans without media interference, but he lurches from here to here. So it’s a dangerous moment, but I think, we have to find stabilizing mechanisms as best as we can. SS: But I also see this, him being an accidental figure trying to get a grip of it, creating a team, a stable team, finally, even though it’s a neoconservative team, and I also see the difference in thinking between him and his advisors, I mean, his advisors, John Bolton would probably love him to go to war with Iran. Trump has been very cautious about it, figuring that, you know, it could be a war with unpredictable, unending consequences. SS: What do you think will prevail at the end, his cautious approach or Anti-Russian sentiment? SS: …Was even worse than now, but somehow Reagan managed to align everyone behind him when he was, like, no, we’re making friends with Russia. KH: But this goes to the demonization of Putin. Listen, I think… I think, in Russia today, we have a kind of soft authoritarian system. But in Gorbachev, Reagan found a partner. I don’t think it’s possible today for Putin and Trump to negotiate in the same way, because Trump is viewed as treasonous when he tries to negotiate with Putin. But I think it’s going to take citizen intervention, it’s going to take other leaders to say: “We need, for common sense, not pro-Russian, not pro-Trump, not pro-Putin, to avert a nuclear peril, to avert conflict.” Look at Syria, if I could, Syria, the destabilization of Syria has led to the destabilization of Europe! The refugee crisis is destabilizing, and where did it emerge from? From Syrian war, from other wars. So I think it’s a very perilous, but challenging moment. SS: You know, I really wonder why Trump at this point is seen as a Putin-lover, because when you think about it logically, it was during Trump administration that most of the Russian diplomats were expelled, it was during Trump administration that lethal aid was sent to Ukraine, it was during Trump administration that Syria was bombed. Not Obama, not any of those things happened during the Obama administration. And yet, Trump is called Putin lackey. Why? KH: You know, Trump was a shock to the American system, and I think for many Americans, particularly Democrats, I am sad to say. Instead of looking deeply into themselves and looking at their own pathologies and problems that American has, the financial crisis, the inequality, the disinformation, the dark money, the suppression of the vote, it’s easier to blame others. And so I think there’s an attempt to blame Russia for Putin, that in the end is not only dangerous, wrong-headed, and leads America not to better understand what it needs to do to reform itself and become a more just, a more democratic country. So, in that sense, Trump also, I think, wants to get the monkey off his back, do you know that expression? RussiaGate. So he’s ready to do these, take these steps, and because he is so undisciplined, and so much about himself, he will listen to these advisors, who are hawkish, as you said, and leading to a bad relationship even when he’s still attacked as a Putin puppet. SS: But… I wonder if Putin is also, you know, not a tool to figure out, you know, and war between the two parties, the Republicans and the Democrats, because when we look at the Democrats and Republicans from out here, we don’t really see much difference, and I’ll tell you why. For instance, I don’t know, like the Clintons, or the Obamas, who are Democrats, at the end of the day, you know, they also embarked on liberal interventionism, and that means war at the end. KH: What America needs now, and the Nation has done several special issues about this… We have a discredited bipartisan foreign policy establishment. Trump’s foreign policy is not the answer, but nor is the liberal foreign policy of interventionism, humanitarian interventionism. We need to focus more on what is next, what is next. And I think that the expansion of NATO, which was as much a Democratic project as a Republican one, is one of the most fateful and ill-begotten projects, and has led us into the part of what we see today. So I think… You know, there’s a lot of lament in America about how the two parties can’t work together, no bipartisanship. Well, there is a bipartisanship when it comes to approving crazy defence budgets, or in terms of worsening and escalating a bad US-Russia relations. So there needs to be a reset. That term has been misused, and ill-used, but there needs to be a re-awakening of an alternative approach to engaging the world on the part of America. It’s very difficult, because America believes it’s the sole superpower, but in this world today, that is not the case. SS: You’ve mentioned NATO, and you’ve called it an organisation in search of a mission, and that, actually, resonates with how Trump called it ‘obsolete’ during his campaign. What do you think NATO’s mission is right now? Especially with America snubbing it? KH: NATO’s mission appears to be to halt the menace of an expansionist Russia, which I think is not the case. I mean, there is a view that Russia is this global menace, so you have NATO on the borders of the Baltic countries. It’s a tripwire for more conflict. NATO should have been abolished at the end of the Soviet Union. I mean, it was there, designed to counter the Warsaw pact. Right now, I think what should happen with NATO is it should halt its expansion, Ukraine should become non-aligned, the future of Ukraine should be as a bridge between East and West, that was the hope. Not as a proxy country for a civil war between the United States and Russia. So you know, when Trump says things like NATO, attacks NATO, he’s right, but he’s the wrong messenger, because people think he’s… Doesn’t know what he’s talking about. SS: NATO has been brought up recently while some of German and French politicians were pondering over the idea of creating a common European army. If that happens - and Trump wants Europeans to take care of their own security - would that make NATO obsolete? KH: I don’t think NATO will become obsolete. NATO needs to find a different mission. My problem with this idea of independent European military force is that I do think that Europe should seize this opportunity of the Trump era to become more independent from America, it saddens me though that it’s in the context of militarisation. SS: Well, Russia and EU stand together on the issue of Iran. Do you think this could have far-reaching consequences - this realignment of Russia and EU - for America? KH: I do, and I think, the realignment of relations between Russia and China will have major implications. I think, there’s a realignment in the world generally that is not fully understood. We’re living through history. And America, as I said, is no longer the sole superpower. And I think part of the reaction to Russia is America believed Russia was on its knees, as you know, in the 90s and treated it as such, and that was part of the expansion of NATO. This is no longer the case. There’s a view in the West that Russia is weak economically. I don’t think that’s the case. I think Russia has a major role to play, China does, Europe does, Latin America is going through convulsions of its own. So, in this period of realignment I would simply say ‘do no harm’. Try not to escalate. Try to de-escalate. And I think, moral posturing is not effective. Dialogue, ratcheting down escalation is critical in this time. We talk about nuclear peril, but we don’t take it seriously enough. Accidental conflicts can happen - look at what’s happening at the sea of Azov, it could escalate. And there are groups in the United States by the way, the Atlantic Council, that are calling for a NATO blockade, and I guarantee you that at the G20 meeting there will be talk of how to punish Russia instead of how to revive the Minsk Accords that have been put by the way - that’s where Europe (France and Germany) could play a constructive role in reviving those peace talks. SS: Katrina, thank you very much for this interview. Have a nice rest of your stay here in Moscow.